So all the months and hard work and sacrifices have come to an end. I set my alarm for 3am so I could be up nice and early to have some solid food as I knew I wasn’t going to get much through the day. I woke at 2:59, a minute before my alarm. Wow, so that was a good start and I switched off my alarm before it went off. Good old body clock! So first things first, porridge and some peanut butter and jam bagels for the car journey to give me plenty of energy. Quick shower and double check I had everything before Alan Wolfarth came to take me to Pennington Flash. So we head to meet Jay Muscart and drive up as a convoy. The nerves have well and truly set in as we arrive. It was cold and wet. Great! Couldn’t we at least have a nice day! Nope not today just to make it even more difficult! I head to Transition with Jay, give the bikes a quick check and pump up the tyres before we start to get the wetsuits on for the swim. We bump into Dean Hanwell who is racked right next . Great numbers we kept saying 724 and 725. We head out and start getting the wetsuits on. Here we go, my nervous cough starts, ‘ha standard Neil’ Jay laughs. Heading to the start with Jay and Dean but couldn’t find Owen Barden or Ian Roche, but I knew I would see them at some point throughout the day. No mass start this year, rolling start based on predicted swim times so I pop myself into the 1 hour category hoping I can jump on the heels of someone to drag me around a little quicker. This did not happen! The horn sounded and off we went. I felt fine and after deciding to treat the swim as a warm up and stick to a nice long stroke. I set off and felt great straight away but kept away the urge to up my pace as I knew this was going to be a long day. I jump out after the first loop seeing friends cheering me on and not feeling tired or out of breath. This was great, the plan was working. (Martin Wolfarth was in my head… ‘keep it long Neil’). Running round soaking up the atmosphere I jumped straight back in but went to deep and hit the bottom. I instantly knew I cut my foot, ‘oh well’. The adrenalin was pumping through me so I moved to one side and fixed my goggles and off I went again on the 2nd lap. Again, feeling very comfortable but with a lot of clear water and I was catching a lot of people fighting the urge not to race the swim. I come to the end and out I go again. Unbelievable atmosphere giving me a massive buzz and not feeling out of breath, ‘brilliant’, the swim went to plan and with a nice 1.05 I thought ‘great!’. 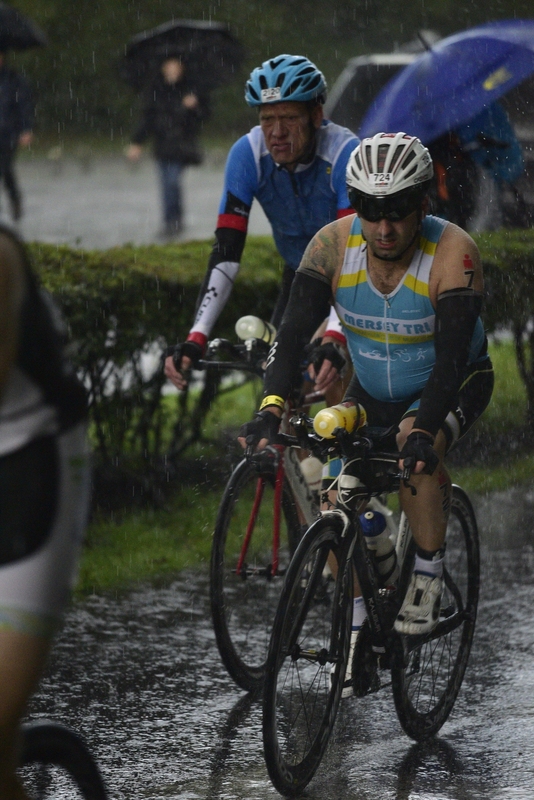 In the changing tent I sit down, arm warmers on, socks on and I take my time as I did not want to rush this, I wanted to compose myself and feel ready as it was still raining hard, so hard to get prepared for the mammoth bike section. A couple of minutes later I see Jay like a flash, he was in and out and last I seen of him till the run. Heading out on the bike coming down the road in Pennington Flash, not even 2 minutes in and Boom! Bottle flys out of my cage on the front of my tri bars. ‘Great!’ I thought, ‘what a start!’ Please let that be the first and last incident. So I settle on the bike and getting used to the rain and wind. ‘Oh well’ I thought, it will blow over within a couple of hours. Heading to Sheephouse Lane for the start of the loop we hit Colt Alley as it’s known. I felt like I was in the tour de France with only enough room for 1 rider. This was amazing! I did not expect that. It felt like they pulled me up that little climb, so eventually hit Sheephouse and I get a pat on my back, none other than Mr Hanwell. Was good to see him looking strong and off he went up the hill. So ‘tap tap tap’ (Paul Skippers mantra in my head) out the hills not pushing them as I felt this would of drained the legs even more. Ticking along feeling comfortable roughly 50km in I drop the gears to spin another hill, what do you know, chain come off and slips in between the frame and chain ring. I couldn’t believe it! Off the bike trying to fix it, eventually sort it with taking back wheel off to give it some slack and loosen the chain. So I pop the wheel back on and go through the gears up and down to double check all is good but I lost a lot of time. ‘Oh well,’ along way to go hopefully no more incidents. Hunters hill approaching and knew I was going to get to see the Mersey Tri crew out in force, heading up Hunters again feeling like the TDF with it being packed most of the way up the hill, everyone giving you loads of support, urging you to go harder, but no, ‘tap it out’ I told myself. So head round the corner and there they were, going bonkers, bringing a smile to my face. So far so good! Heading to lap 2 not before hitting Colt Alley again, even more Goosebumps this time. I was amazed these people were still out there in the poor weather conditions. Up Sheephouse we go and zoom Owen is passed me looking strong as well. Hitting the descent with more confidence and dry roads compared to the 1st loop, zooming down, ‘weeeee!’ Bottle goes flying again but a spectator kindly passes me the bottle. Off I go plodding on, trying to keep hydrated and constantly eating as the big miles were approaching. Counting down in 10kms I thought was a good idea, it seemed to work so I stuck to it. At this point I seemed to be with the same group of riders talking, asking how we all were feeling, passing each other then re-overtaking for the majority of the last 50km. At this point no more problems with the chain but the wind seemed to be getting stronger or maybe that was just in my head. Hunters one last time seeing the Mersey Tri crew and high fiving Paul Williams I nearly went flying! ‘ha,’ I was laughing as I went past. Now heading past Sheephouse looking for that wonderful site of the Macron Stadium I was relieved to finally be off the bike leg! ‘Wow,’ that was tough. In T2, another long one but I didn’t care, I was composing myself. Run visor on, change of socks and run shoes and Garmin on. Off I went. I decided a run walk strategy was best as my legs were so tired and cramping a lot. This worked and kept me consistent throughout the day. So before we hit the loop I see Paddy McGuiness, I said hello. He showed his support, I think he was trying to get home (road closures aye!) I should of shouted ‘let the Iron see the Man!’ So nearly at the start of the loop getting excited and feeling my run walk strategy working, I bumped into Alan again, urging me on telling me the loop was up the road. He was right, I hit the loop to what I thought was a massive party! The atmosphere was amazing, gradually running up the small incline and hitting the turn point I see Jay. We give a quick high 5 and off I went, I head down and seen Ian Roche looking like a man possessed! He was a machine, I was in awe to be honest, he looked fresh, a quick chat and explains his fun on the bike and swim. His goggles snapped he told me at the start. I was gutted for him but he found some and cracked on, ‘Brilliant’ I thought. The crowds just amazing, constant support from everyone. I head down and see all my friends and family. I was definitely emotional at this point, not sure I could talk properly, I see my Mum, Dad and Brother, but I think they were more relieved to see me. My poor parents, the stress, I don’t know how they put up with me and all my Ironman talk. Coming round the corner I see Jay heading into the finish,. He runs past me and smacks my bum! Typical! So quick chat, happy to see everyone. I’m now walking with Derek Bate alongside me keeping my spirits up. So I pick up the pace and start running picking up my first band. Happy days! The next loop the blue one, that will do me! Still feeling okay but then cramp really kicks in. Alan was back with me just telling me to walk through it and stretch. This really worked and I plodded on feeling tired and then my mood changed. I noticed I was a bit short of breath and wanted to finish! My Dad running next to me for a few meters, he tried to encourage me after coming out the city centre for the 2nd loop but this did not help me, although looking back I was grateful he was trying to help. Moody Neil was the head instead of Happy Neil. I run through collect my blue band, starting to feel happier knowing next time round was my last band and I would be finishing! This was a great feeling and my mood changed, walking through aid stations picking up Bananas, flat coke and electrolytes each time. I felt good, no stomach issues and now heading up seeing friends and family, knowing next time I see them I will be running through the finisher chute. This was great. Again walking up that nasty hill out of the city centre I’ve got Matt Eglen with me, chatting away, keeping my mind distracted so Moody Neil didn’t come back. Getting my red band I thanked all the volunteers with all them cheering me on and patting me on the shoulders. What support they were. I head up, take in pretzels and flat coke again as well as a banana. Boom! Energy kick! 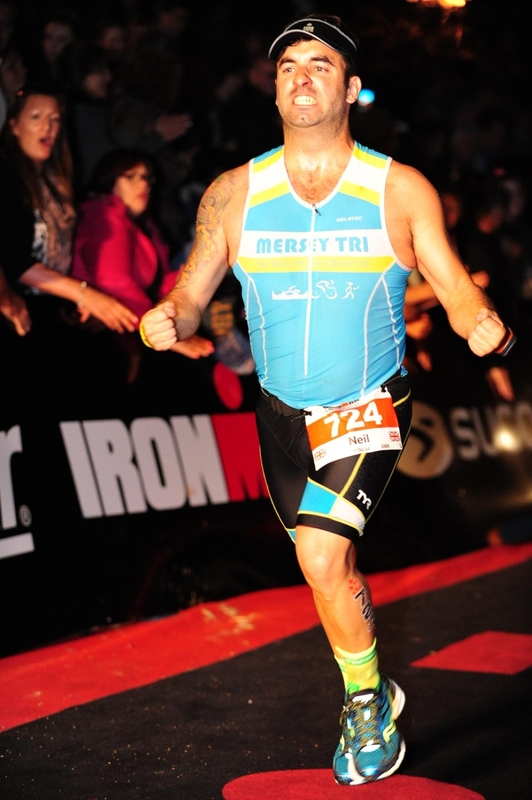 I picked up the pace and ran and ran, I felt great knowing I was about to become an Ironman. I take my last turn and head into the city centre and Matt wanted a quick selfie, ‘why not’ I thought! Running down along and into the finisher chute I hear the voice of the main man Paul Kaye so I decided to rob Bryan Riley’s aeroplane finish and then I just let loosed and exploded through the finish! I couldn’t believe it! 16 hours 10 minutes! I was made up! ‘What a day’ I thought. Adrenalin all gone, my body seizes up. I struggle to walk and I start to feel the cut on my foot but this was all worth it! This was my race experience and was very humbled to have such great support around me from friends and family and the Mersey Tri crew. I see all the friends at the end and everyone was on a high. I couldn’t believe it! I then ring the parents as my Dad wasn’t feeling well so left just after I started my last lap. He was proud and my Mum as well. She says ‘no more!’ Laughing I knowing I want more… although maybe not just yet. I was made up both parents and my brother were there and all the friends who supported me, it would not of been the same without you.